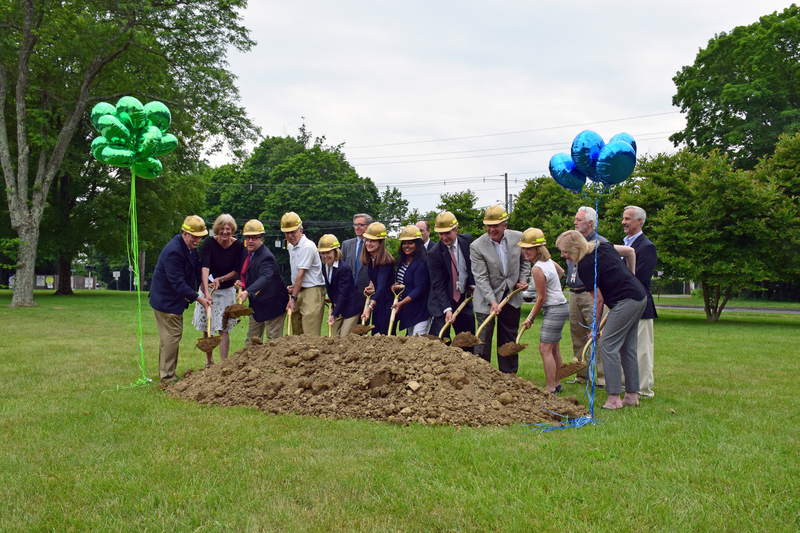 O&G Industries, Connecticut’s largest privately-held construction company and the State’s top school construction manager, recently broke ground on the $18.6 million Saxe Middle School Addition and Renovation project. A formal ground breaking ceremony to kick-off the project took place at the School on Thursday, June 16th. The ceremony was attended by School administrators, staff and students, members of the Building Committee and the construction team. O&G will act as the Construction Manager for this addition and renovation project. Construction will include a two-story classroom addition that will add 12 new classrooms, a STEM classroom, renovation of its 58-year-old auditorium, right-sizing of the School’s music rooms and added storage within the auditorium and music spaces. The expansion will alleviate current overcrowding and provide the excess capacity necessary to manage the projected enrollment increase over the next decade. Joining O&G on the project team are the Owner’s Representative SLAM Construction Services, Project Architect JCJ Architecture, MEP Consultant OLA Consulting Engineers, Structural Engineer Macchi Engineers, and Environmental Consultant Tighe & Bond.